Swakopmund is known for adventure, wildlife, museums, parks, and zoos & aquariums. Your plan includes some of its best attractions: take an exotic tour of a safari tour, see the interesting displays at Swakopmund Museum, take in the architecture and atmosphere at German Evangelical Lutheran Church, and tour the pleasant surroundings at Welwitschia Plains. To find maps, other places to visit, ratings, and other tourist information, you can read our Swakopmund trip itinerary planner . Amsterdam, Holland to Swakopmund is an approximately 18-hour flight. You can also do a combination of train and flight; or do a combination of flight and shuttle. You'll lose 1 hour traveling from Amsterdam to Swakopmund due to the time zone difference. In September, daily temperatures in Swakopmund can reach 24°C, while at night they dip to 12°C. 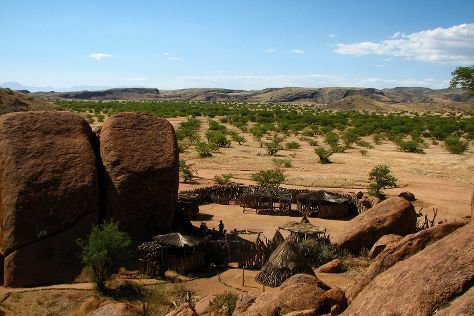 Wrap up your sightseeing on the 11th (Wed) early enough to drive to Damaraland. Kick off your visit on the 12th (Thu): see the interesting displays at Damara Living Museum and then pause for some photo ops at Twyfelfontein. To see maps, photos, where to stay, and other tourist information, read our Damaraland online itinerary planner . Traveling by car from Swakopmund to Damaraland takes 3 hours. Finish your sightseeing early on the 12th (Thu) so you can drive to Walvis Bay. Kick off your visit on the 13th (Fri): head outdoors with Outdoor Activities and then see majestic marine mammals with a dolphin and whale watching tour. On the 14th (Sat), you'll have a packed day of sightseeing: take a leisurely stroll along Walvis Bay Waterfront, then tour the pleasant surroundings at Long Beach Leisure Park, and then stroll through Dune 7. For maps, traveler tips, other places to visit, and more tourist information, use the Walvis Bay sightseeing planner . You can drive from Damaraland to Walvis Bay in 3.5 hours. In September, daily temperatures in Walvis Bay can reach 24°C, while at night they dip to 12°C. Finish your sightseeing early on the 14th (Sat) to allow enough time to travel to Etosha National Park. On the 15th (Sun), don't miss a visit to Okaukuejo waterhole. For traveler tips, photos, and other tourist information, use the Etosha National Park driving holiday planner . Getting from Walvis Bay to Etosha National Park by flight takes about 4 hours. Other options: do a combination of bus and shuttle; or do a combination of train and shuttle. Wrap up your sightseeing by early afternoon on the 15th (Sun) to allow time for travel to Otjiwarongo. 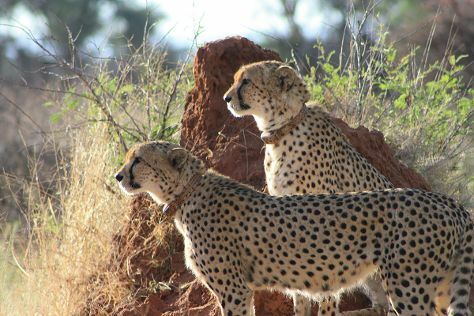 On the 16th (Mon), tour the pleasant surroundings at Cheetah Conservation Fund. Get ready for a full day of sightseeing on the 17th (Tue): tour the pleasant surroundings at REST - Rare & Endangered Species Trust and then tour the pleasant surroundings at Africat. Plan my Otjiwarongo trip by asking Inpirock to come up with tips and suggestions. Use the Route module to find suitable travel options from Etosha National Park to Otjiwarongo. September in Otjiwarongo sees daily highs of 38°C and lows of 17°C at night. Finish your sightseeing early on the 17th (Tue) so you can travel to Luderitz. 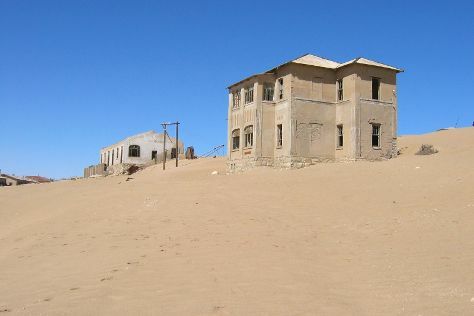 Kick off your visit on the 18th (Wed): enjoy the sea views from Diaz Point, pause for some serene contemplation at Felsenkirche, and then mingle with the ghosts of the past at Kolmanskop Ghost Town. For where to stay, traveler tips, maps, and other tourist information, read our Luderitz trip planning site . You can do a combination of car and flight from Otjiwarongo to Luderitz in 4.5 hours. Alternatively, you can drive. Traveling from Otjiwarongo in September, you will find days in Luderitz are much colder (24°C), and nights are slightly colder (12°C). Wrap up your sightseeing on the 18th (Wed) to allow time to travel to Windhoek. Spend the 19th (Thu) spotting exotic species with a safari tour. Next up on the itinerary: head outdoors with Deadvlei, stroll through NamibRand Nature Reserve, examine the collection at National Museum of Namibia, and contemplate in the serene atmosphere at Christuskirche. To find where to stay, ratings, other places to visit, and other tourist information, read our Windhoek online road trip planner . You can do a combination of flight and car from Luderitz to Windhoek in 2 hours. Another option is to drive. Traveling from Luderitz in September, expect Windhoek to be a bit warmer, temps between 34°C and 16°C. Wrap up your sightseeing on the 21st (Sat) to allow time to travel back home.